Mark your calendars, because the first lunar eclipse of 2019 takes place this month, from Jan. 20 to 21, to be exact. It’s called the super blood wolf moon, and your next chance to see a total lunar eclipse like this won’t come until 2021 — so you don’t want to miss it. Let’s break down exactly what it is and why it’s so important. In short, it’s a total lunar eclipse that’s occurring at a unique time. What’s happening is Earth will pass between the sun and moon, causing a shadow to be cast over the moon. 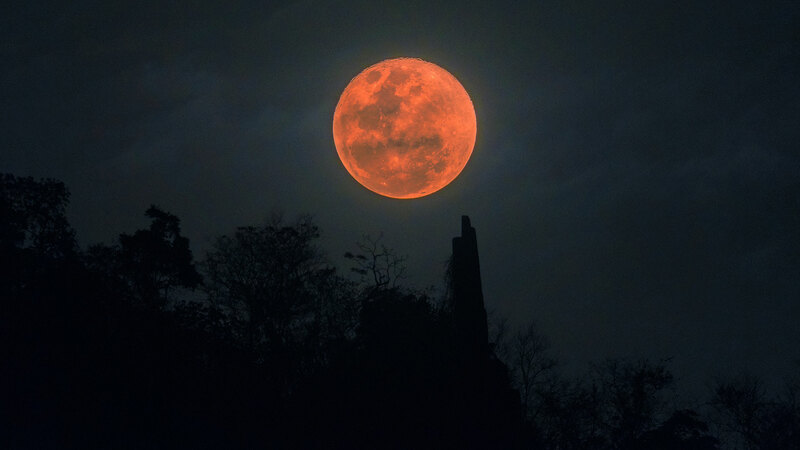 It’s called a blood moon because the shadow will also give the moon a reddish hue. Another key factor that makes this spectacle so unique is that this is all taking place during a supermoon, which occurs when the moon is both in its full phase and closest to Earth (known as perigee), causing it to appear bigger and brighter than usual. But why is it also called a wolf moon? According to Mental Floss, a full moon in January has been called a wolf moon since colonial times and is often attributed to Native American folklore by almanac writers. According to Space.com, the eastern side of North America has the best view, but rest assured, all states will see the lunar eclipse — which will last just over one hour — just fine. Elsewhere in the world, the lunar eclipse will be totally visible across South America and parts of Western Europe and Africa, according to The Weather Network; and other parts of Africa, Europe and Asia will see a partial eclipse. The super blood wolf moon is expected to start its first stage at 9:36 p.m. ET/6:36 p.m. PT. The second stage will hit around 10:34 p.m. ET. But here’s the time you should jot down on a sticky note somewhere: The total eclipse begins at 11:41 p.m. ET. The middle of the eclipse is at 12:13 a.m. ET, and the total eclipse ends at 12:43 a.m. ET. Space.com has a handy super blood wolf moon time chart you can bookmark or print for reference later. The next stargazing events are supermoons on Feb. 19 and March 21, the Eta Aquarids meteor shower on May 6 and 7, a rare total eclipse on July 2 and a partial lunar eclipse on July 16. The next total lunar eclipse will take place May 26, 2021, so it’s probably worth staying up late to catch this one!